The downside is that you have no actual control over the values you can assign to attackType: it can be any integer, and you can also do dangerous things such as attackType++. attackType = AttackType.Poison; Debug.Log("Attack: " + attackType); # Prints "Attack: Poison"
Debug.Log("Attack: " + attackType); # Prints "Attack: Poison"
Casting an enum to int will return its integer value. To be fair, enums are actual integers. At this stage, the variable attackType can be seen as a series of bits, each one indicating if it has or not a certain property. If the first bit is one, it is a melee attack; if the second bit is one, it is a fire attack, if the third bit is one it is an ice attack, and so on. It is important to notice in order for this to work, labels have to be manually initialised as powers of two. We will see later in this post how to do it more elegantly. Lastly, since enums are normally stored into Int32, it’s unwise to have an enum with more then 32 different labels. To be fair, you can use enums even without [Flags]. The only thing it does is allowing a nicer output ofenums when they are printed. A bit mask is, essentially, an integer value in which several binary property (yes/no) are independently stored in its bit. In order to pack and unpack them we need some special operators. C# calls them bitwise operator, because they work on a bit to bit basis, ignoring carries unlikely addition and subtraction operators. What the bitwise OR does is setting the bit in the i-th position to 1 if either one of its operands has the i-th bit to 1. The complementary operator to the bitwise OR is the bitwise AND. It works in the exact same way, with the exception that when applied with two integers it keeps only the bits which are set in both of them. While bitwise OR is used to set bits, bitwise AND is typically used to unpack property previously stores in an integer. When it comes to None, this behaviour might or might not be what you want. Just be aware that the standard .NET implementation of HasFlag uses our latest example. If you don’t want to go crazy, you can also define None as 1 instead. Just remember that is preferable to always have a zero value in an enum. By negating the property AttackType.Fire we are left with a bitmask which has all 1s, except for a zero in the position relative to the fire property. When AND-ed with attackType, it will leave all the other bits unchanged and unset the fire property. After OR, AND and NOT, we cannot not mention the bitwise XOR. As the name suggest, it is used to xor bits in the same position of an integer variable. The xor (or exclusive or) of two binary values is true only if one or the other is true, but not both. This has a very important meaning for bit masks, since it allows to toggle a value. The technique described in this post is flexible enough to be adapted not just to attack types but also to inventory systems, item properties and finite state machines. If instead you prefer a dropdown menu, you should check Unity’s EnumMaskField. Thank you so much for all of your writings! Unfortunately i’m not in a situation where i could become a patron, but i can promise you that if i anything in the future i will give you the credits! No I’m wrong, stupid me. Flippen good article, thank you! for b is none, (a & b) == b returns always true, doesn’t it? so none(0) always exist as a flag?? hi Alan, with Unity 2017 I have a problem using FlagsAttribute, it doesn’t recognize the HasFlag method and the bitwise operators does not work as expected. Hey! Can you tell me more about the error you’re receiving? Great article. I really wish I could up-vote it like a Stack Overflow answer! Hehe thank you, I guess I’ll have to find a WordPress plugin for that! Brilliant. jeeez “hasflags” makes life easy! 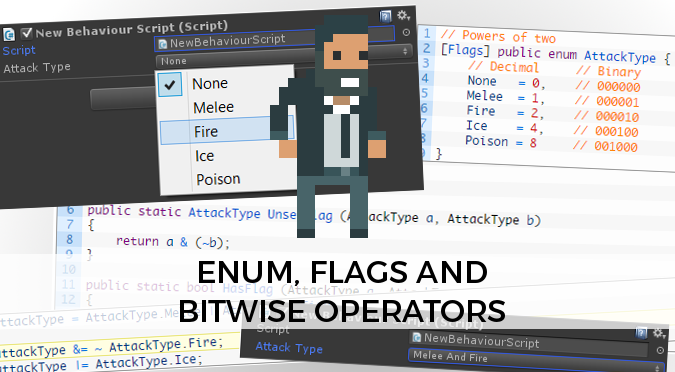 As a beginner -> intermediate C# programmer, I stumbled across enum flags and bitwise operators in one of the Unity courses on Coursera. I’ve spent the last day trying to wrap my head around bits, bitmasks, etc. and after reading through this tutorial (amongst a couple of others) about 4 times, I think I finally get it. Everything I need to play with bits in one single fun article. Thanks very much for this post, it helps me a lot to understand Bitwise operators. I’m writing a new series about lambda expressions in C#. I hope you’ll like that as well.